1888 Sir John Whittaker Ellis buys the site of the Castle Hotel and gives it to the Richmond Vestry for a new municipal building. The Vestry runs a competition to design the new municipal building. 1889 The contract for the Town Hall is awarded to W.J. Ancell after the Vestry rejects the 2 prize winners - Elkington & Son and Thomas Verity. The builder is J.W. Brooking (Lansdown & Co) Richmond. Drawing by W.J. Ancell of the Hill Street elevation of the Town Hall. W.J. Ancell's proposals for Richmond Town Hall, 1889. 1890 On the 23rd July 1890 Richmond becomes a borough and receives its Charter of Incorporation. Sir John Whittaker Ellis becomes Richmond's first Mayor. 1893 The Town Hall is opened by the Duke of York, later George V, on 10th June 1893, with Princess May, the future Queen Mary. Address by the Mayor of Richmond on the opening of the Town Hall. The Town Hall clock case was designed by the architect W.J. Ancell and given by Sir Francis Cook. The clock was made by Messrs Potts & Sons of Leeds, and the bell and chimes by Taylor & Co of Loughborough. The clock and chimes were given by the Mayor, Alderman Charles Burt. Plans for Richmond Town Hall clock. The Town Hall includes a Council Chamber, committee rooms, Mayor's parlour and Councillor's rooms as well as offices for the Town Clerk, Borough Surveyor, Medical Officer of Health, Inspector of Nuisances and the Gas Tester. There is also accommodation for a caretaker and hall keeper. Architect's plans for the basement. 1895 On 30th July 1895, Princess Mary Adelaide, Duchess of Teck (who lived at White Lodge in Richmond Park) unveils a bust of Whittaker Ellis, sculpted by Francis Williamson. Bust of Sir John Whittaker Ellis. The Town Hall from the river. Undated postcard. 1910 The Proclamation of George V is read out from the Town Hall. 1940 The Town Hall suffers severe fire-bomb damage in one of the worst WWII air raids during the night of 29th November 1940. The roof and top floor are completely destroyed and the Council Chamber gutted. The original Victorian council chamber. After the war the Town Hall is refurbished and modified. Extra offices are built above the restored Council Chamber and a flat provided for the Town Hall Keeper. The 'new' council chamber after the post war renovations. 1952 Queen Elizabeth the Queen Mother opens the refurbished Town Hall on 16th December 1952. Queen Elizabeth the Queen Mother opens the Town Hall. Richmond Town Hall after the rebuilding work. 1965 Richmond is incorporated with the Boroughs of Barnes and Twickenham to become the London Borough of Richmond upon Thames. York House becomes the main municipal building. Richmond Town Hall is used as office space. Side view of the Old Town Hall in 1979. 1985 Richmond riverside between Water Lane and Richmond Bridge is redeveloped to a design by Quinlan Terry. The Town Hall is modified and refurbished and becomes the home for the Reference Library, Local Studies Collection, Tourist and Community Information Centre and Museum of Richmond. Model of the Quinlan Terry Riverside development. 1988 HM Queen Elizabeth II opens the Riverside Development on the 28th October. 2000 An extension is built into the attic to accommodate a new air conditioned store for the Local Studies Collection. The Twickenham and Richmond collections are incorporated and a new Local Studies Centre opened. 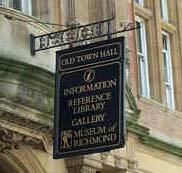 Richmond Old Town Hall in 2000.